Claire and John laugh at Tom serving food. We had loads of fun and games last Friday to raise funds for Daffodil day, in aid of the Irish Cancer Society. Daffodil day raised a total of �2.16m last year and this year we raised �4,500 between the company's network of offices. They had a scheme called "Back to the shop floor" where managers do tasks that the bottom levels would do. Of course a CEO doing her own job or doing my job looks the same: sit in front of a computer and mash the keyboard, so they were given more unusual tasks. 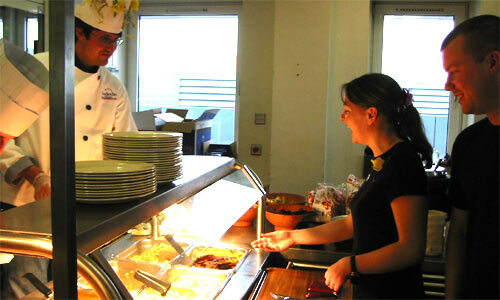 Tom and Andrew were busy serving food in the canteen for an hour, Tony was outside washing cars. Other staff found things to do to raise money too, Eanna, Isobel and Niall assembled a fan, Chris took orders for stationary, and the end of level bosses came around with tea and bikkies. A few crazy things went on too, like lads having some of their leg waxed, a dry cracker eating competition (with one chap getting sick halfway through!) and Dave had his beard shaved. Annette is still facilitating donations until Thursday, when she will tell us the grand total. An initiative to encourage designers to compete, see each others work and fill up their portfolio, Brian and Waltzer have created the Super Styley Awards. Open to all here in the House, designers and non-designers, the competition will be run on a monthly basis. Each entrant pays us �10 and provides us with a couple of ideas for a theme. The theme is chosen and each entrant designs a piece of artwork to complement it. A judge decides which is the winner based on a variety of factors, and the winner takes all the entry fees and a certificate to say they have won. Each month the details and entries will appear at superstyley.com so even if you don't take part, you can check out how it's going. This month is a pre launch, just a few people are taking part, but next month we hope to announce it properly and take a few more entries. If you would like to join us, the closing date is Thursday and you have to give Brian or me your money and ideas by then. Good luck to all participating. Ranelagh, Ireland - A bar girl was blatently accused of having no sense of humour on Sunday night. Mr Richie Barbie was outside the pub afterwards when he announced his slamming criticism of the 50's styled Kylie lookalike. She has been working in McSorley's for the past few months and is well admired by The Johns and that crowd. "Ah she's a cutie alright but has no sense of humour" Barbie commented to a friend. Upon asking if he cracked a joke or what, Barbie said, "No but she wasn't really that interested when I explained to her the difference between Erdinger and Budvar. And she didn't smile once, even when we were leaving." Although he agreed that maybe she doesn't like her job, he insisted that "It wouldn't break her face to smile." Friday saw a group of five from the office make the short trip to Stillorgan to see Jody's new play 'The Field.' Having been impressed by the quality of production on our earlier trip to the theatre, we looked forward to more of the same. A few pints and a manky spring roll later, we took our seats. For those unfamiliar to the play, or the film, the story revolves around the main character of Bull McCabe, a temperamental farmer who for the last five years has, along with his equally combustible son Tadgh, transformed a once rocky plain into a lush green pasture. When the field, rented to Bull by an elderly widow, is put up for public auction, father and son conspire with the local residents to fix the sale. All doesn't go to plan when an interested businessman from England gets wind of the widow's auction. Bull and Tadgh are desperate to retain the field at any cost, and in a particularly powerful scene they launch a viscous attack on the unsuspecting investor. Tadgh, played by Jody, reigns a power of frenzied blows on William Dee and in a rush of blood, administering a fatal kick to the head. The outsider is dead, and locals, through fear, are silenced from co-operating with the subsequent investigation. Jody gives us a flawless performance as the cocky and intimidating Son of Bull, despite talking with his mouth full in act 2. If any of us were still in any doubt about dark horse Jub's talent, then we left safe in the knowledge that he really does love the smell of napalm in the morning, if he isn't eating a sandwich at the time! The field is written by John B Keane and was staged by Martello who, according to the programme, have a list of past productions as long as your longest arm. Given the hard work and delivery of the 20 strong cast, it seems more than a little unfair to call this amateur, and during our last two trips to the theatre I definitely have more of a taste for it. Credit to the backroom staff who as well as giving out free bikkies gained the coveted title of 'the weakest tea in Ireland', beating an earlier attempt when a box of Barry's was thrown into the Liffey. 'Break a leg' to Jody and the cast as they take their production to the Isle of Mann next month.